Fall armyworms are approximately 1-1½ inches long, depending on instar, and can vary in color from a green to mottled brown, to almost black (Figure 1). Fall armyworms have wide black stripe running down each lateral (side) of the body. 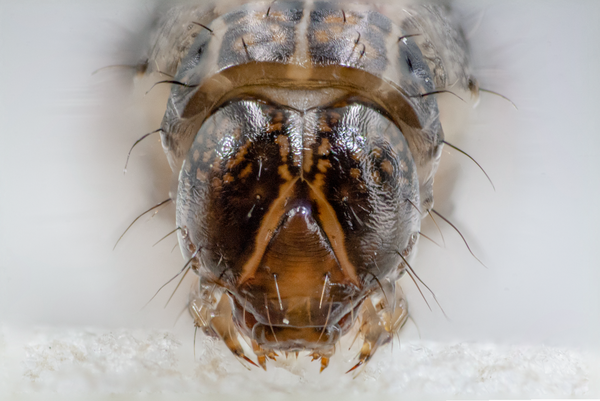 Sometimes, you will be able to distinguish four black dots on the dorsal (back) side of each segment of the abdomen and a light-colored, upside-down “Y” marking on the head capsule (Figure 2). Fall armyworms, similar to some other immatures of moth species, have four pairs of prolegs attached to the abdomen. Adult moths are more difficult to distinguish from other species. 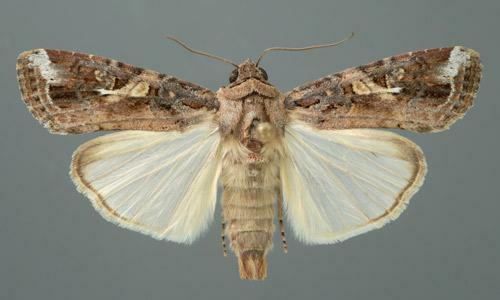 Each moth has a wingspan of approximately 1-1½ inches, the hind wings are white (same as cutworms) but the fore (front) wings have a noticeable white spot near the center of the wing (Figure 3). Fall armyworms have a very wide host range but generally prefer plants in the grass (Poaceae) family, low-growing herbaceous growth and woody shrubs. Most grasses, including coastal bermudagrass, fescue, ryegrass, bluegrass, Johnsongrass, timothy, corn, sorghum, Sudangrass, and small grain crops, are subject to infestation. 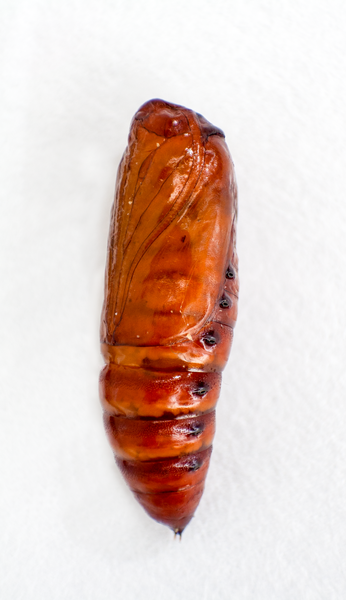 Fall armyworms that attack turf in North Carolina likely overwintered as pupae in Florida. As the adults emerge from their pupal cases, they migrate northward throughout the spring and summer. Fall In mid-summer (July), female moths lay eggs in clusters on the surface of most kinds of vegetation (Figure 4). They will also lay eggs on flat surfaces of neighboring structures (posts, signs, buildings). On moth can lay as many as 1,000 eggs which hatch within 2-10 days. As the eggs hatch, the larvae feed on the remains of the egg mass then drop to the soil surface to search for food. Unlike other caterpillar species, fall armyworms will feed day or night, but are usually most active early in the morning or late in the evening. In large populations, fall armyworms can consume all the foliar tissue available and crawl in “armies” to nearby crops or turf stands. After the larvae feed for 2-3 weeks, they dig into the soil and pupate (Figure 5). Within two weeks, a new population of moths emerges. Several generations occur each year in North Carolina and earlier infestations tend to occur following a mild winter. Although armyworms may be better known as agricultural crops pests, they can be a sporadic but serious pest of turfgrasses. Fall armyworm damage in turfgrass is very distinctive. Since armyworms cross the turf surface as a group, they create a noticeable line between damaged and undamaged turfgrass. Usually damaged areas will originate around a site where egg masses can be easily laid (signposts, buildings) and radiate outward. Although fall armyworms do not have many specific preferences, newly-installed sod is more attractive and more susceptible to damage. Often, natural enemies can keep fall armyworm populations in check. However, cold, wet springs can reduce the effectiveness of parasitic organisms and cannot effectively control large armyworm populations. 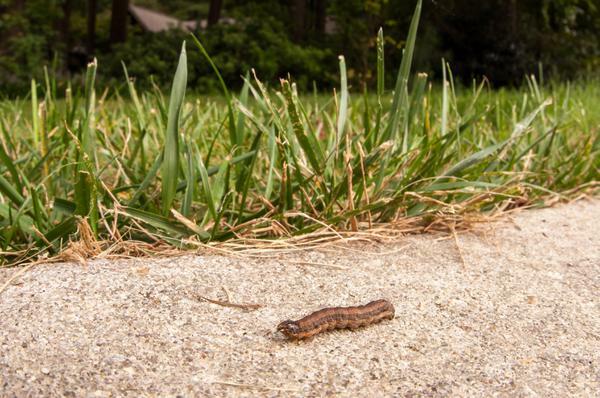 Fall armyworms can be more difficult to control than other caterpillar pests (true armyworms, black cutworms). When possible, mow and lightly irrigate the turf prior to treating. Insecticides are generally ineffective against large larvae so be sure to note the size of the armyworms before making an application. Large larvae are likely to finish feeding and burrow into the soil to pupate so only treat if larvae are relatively small. Pyrethroids (particularly lambda-cyhalothrin) and carbamates (carbaryl), will provide somewhat effective control against smaller larvae. Chlorantraniliprole will also control turf-feeding caterpillars, if applied very early. For specific control information, consult your N.C. Cooperative Extension center for recommendations. acephate* (Orthene, T, T&O) 0.5 to 1.2 oz Water in immediately after application. chlorpyrifos* (Dursban) 4 E, 2 E, 50WP, Pro See label For use on golf courses; check new label. indoxacarb (Provaunt) SC 0.0625 to 0.25 fl oz Not labeled for use on sod farms. 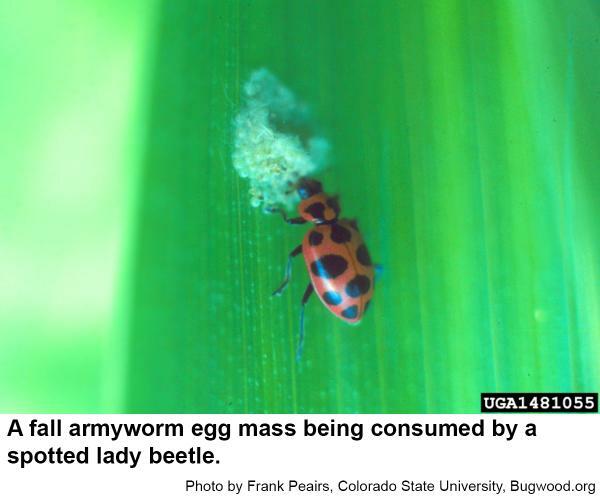 A lady beetle feeding on fall armyworm eggs. Common name: fall armyworm, scientific name: Spodoptera frugiperda (J.E. Smith) (Insecta: Lepidoptera: Noctuidae). John L. Capinera, J. L. 2017 (revised). Entomology & Nematology, FDACS/DPI, EDIS Publication Number: EENY-98. Fall Armyworm (Lepidoptera: Noctuidae) Resistance in Texas Bluegrass, Kentucky Bluegrass, and Their Hybrids (Poa spp). Reinert, J. A. and J. C. Read. 2008. Florida Entomologist 91 (4): 592-597.
Review of Fall Armyworm (Lepidoptera: Noctuidae) Genetic Complexity and Migration. Nagoshi, R. N. and R.L. Meagher. 2008. Florida Entomologist, 91(4):546-554.